- Includes 3 mini-doll figures: Stephanie, dad James and mom Alicia, plus Chili the baby rabbit figure. - Features a modular 2-story house with a kitchen, porch, lounge, spiral staircase, bedroom, bathroom, office and a rabbit hutch. - Downstairs features an opening front door, hallway with opening door, kitchen with bay window, opening oven, hob, cooker hood, sink and table with chair and window seat, and a lounge with opening door, sofa, coffee table and a TV. - Upstairs features a bedroom with bed, desk and opening door to a curved balcony, a shower room with toilet, shower and basin, and an office with desk, swivel chair and a laptop. - Outside area features a porch with swing chair to seat 3 mini-dolls, mailbox and a rabbit hutch. - Accessory elements include a cake, 2 cupcakes, frying pan, 3 plates, bowl, kitchen utensils, storage jar, buildable vacuum cleaner, shampoo bottle, perfume bottle, brush, 2 magazines, basket, carrot, flowers and a vase. - Build and customize this beautiful, modular house with stained glass windows. - Get busy in the kitchen with Stephanie making tasty treats for all her friends. - Help mom Alicia feed the baby rabbit while dad James vacuums the lounge. - Climb the open spiral staircase and head to the balcony to watch out for guests arriving or share friendship moments on the swing chair in the porch. 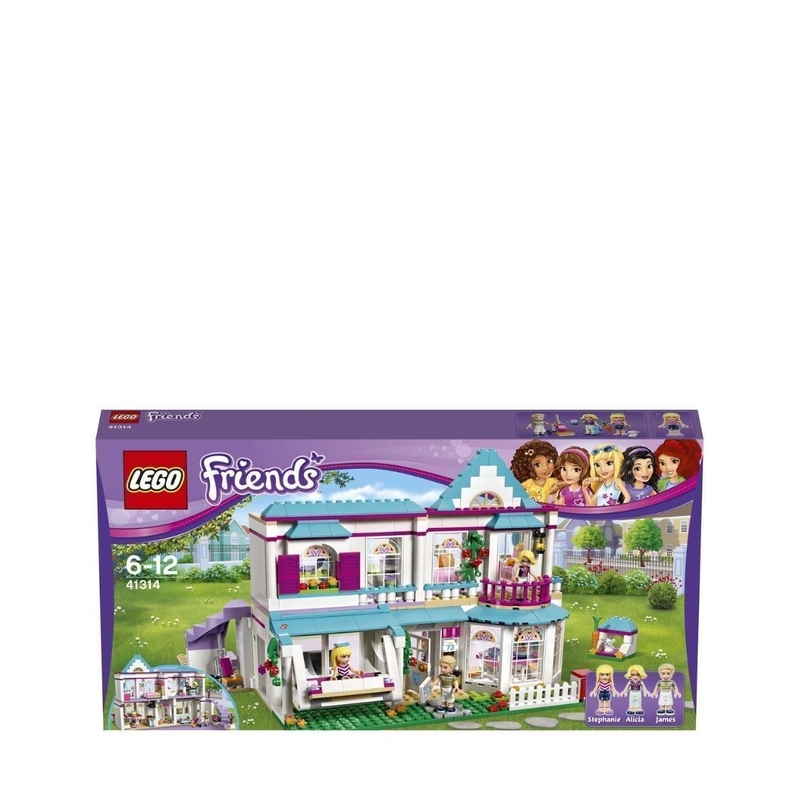 - This set offers an age-appropriate build and play experience for ages 6-12. - Stephanie's House measures over 8” (22cm) high, 9” (25cm) wide and 10” (27cm) deep. - Rabbit hutch measures over 1” (3cm) high, 1” (3cm) wide and 1” (3cm) deep.